A Guarantor is a required. Payslips (3 months) or CPF statements (12 months) required. 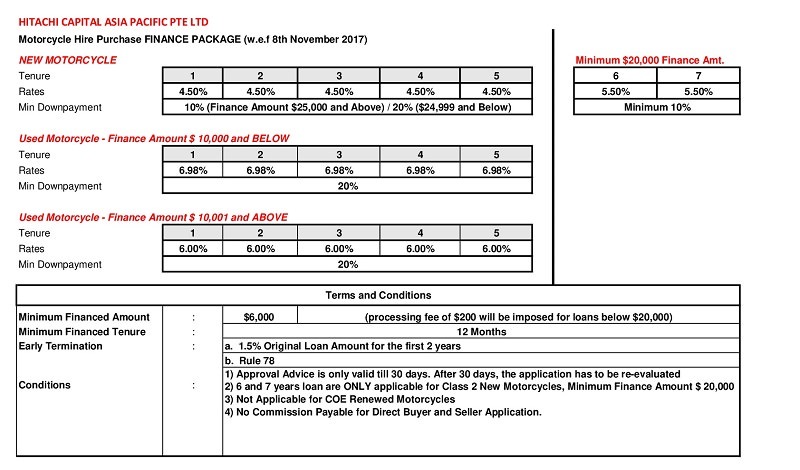 Insurance must be purchased through Unique Motorsports Pte Ltd. Minimum Insurance coverage is Third Party, Fire and Theft Coverage (TPFT). Interest rates: 5% per annum for new bikes, up to a maximum 4 years, subject to Finance Approval. Interest rates: 8% per annum for used bikes, up to a maximum 4 years, subject to Finance Approval. Owner or Director is required to act as Guarantor. Payslips (3 months) or CPF statements (12 months) or IRAS NOA required. Insurance have to be purchased through Unique Motorsports Pte Ltd.